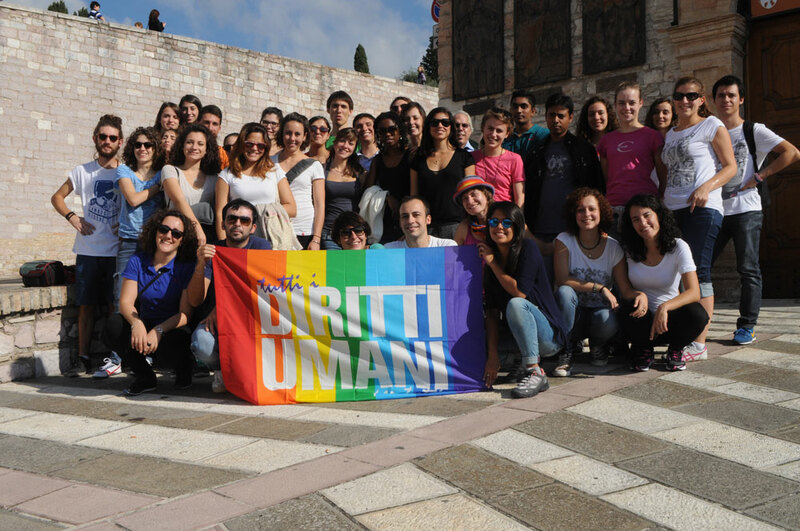 A group of fifty students and National Civil Service Volunteers of the University of Padua, coordinated by the Human Rights Centre and the UNESCO Chair Human Rights, Democracy and Peace, participated in the Peace March Perugia-Assisi on 18 -19 October 2014. On Saturday 18th, after its arrival in Assisi, the group attended the conference titled "Illuminiamo le periferie del mondo" ("Let's light the suburbs of the World") in the press room of the Sacro Convento. The conference, promoted by the Association Article21, the National Coordinating Body of Local Authorities for Peace and Human Rights, the Peace Roundtable (Tavola della Pace) and by the Network of Schools for Peace (Rete delle Scuole per la Pace), saw the participation of communication experts, students and professors, members of the associations committed to the protection of human rights, trade unions, Institutions, representatives of different religions. On Sunday 19th, the students and the volunteers walked the whole route from Perugia to Assisi, carrying with them twenty-eight posters bearing the words: Human Right to Peace in twenty-eight languages, in support of the International Campaign for the recognition of the human right to peace. In particular, the students and the volunteers played a very important role during a special moment in front of the Church of San Francesco in Assisi. On that occasion, Milena Anzani e Oldian Metaj, two young National Civil Service volunteers of the University of Padua, surrounded by 50 Mayors, read a Document, written by the Human Rights Centre, which states:" We, the members of the human family and of the peoples of the United Nations, have the Right to Peace". This Document refers to the draft of the United Nations Declaration for the international recognition of the human right to peace as a fundamental right of individuals and peoples, which is being discussed in these months at the UN Human Rights Council in Geneva, and to the Petitionary Motion, which has so far been approved by over 300 Local and Regional Authorities in support to the UN initiative. The Document urges the representatives of States, in particular, the Italian Parliament and Government, to commit the Permanent Mission of Italy to the United Nations in Geneva to actively participate in finalising the Declaration on the Right to Peace, dissociating themselves from the Countries that oppose the recognition of Peace as a human right. Professor Marco Mascia, Director of the Human Rights Centre, and Professor Antonio Papisca, UNESCO Chair "Human Rights, Democracy and Peace", were present in San Francesco square, hearing the speech.